PIKETON — Need a break from the hustle and bustle of the holiday season? Then consider spending a relaxing and educational day at The Ohio State University South Centers learning the art of wine grape growing and wine production. 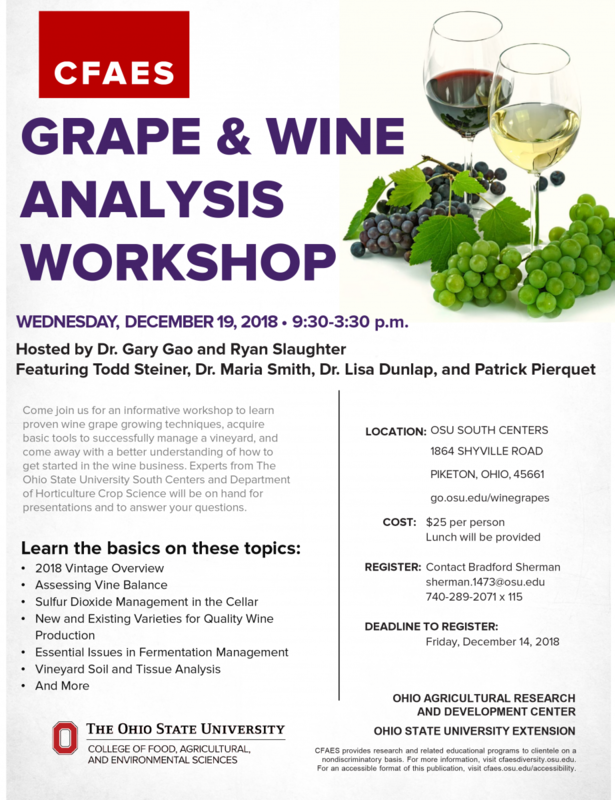 OSU South Centers will host a Grape and Wine Analysis Workshop from 9:30 a.m. until 3:30 p.m. Wednesday, December 19. This daytime educational opportunity will feature Dr. Gary Gao, Associate Professor and Extension Specialist, and Research Assistant Ryan Slaughter, along with several expert guest presenters. The cost of the workshop is $25 per person and includes a lunch. You must preregister by Friday, December 14 by calling Program Assistant Bradford Sherman at 740-289-2071 ext. 115 or by emailing your registration information to sherman.1473@osu.edu. “We have been running this very popular program for quite a few years now,” said Gao. “Attendees will learn the basics of wine grape growing and winemaking techniques.” Gao added that those who take part in this program will learn proven grape growing techniques, acquire basic tools to successfully manage a vineyard, and come away with a better understanding of how to get started in the wine business. The impact that grape growing and wine making has on the economy of Ohio is around $1.3 billion each year. According to data from a 2016 economic impact study, Ohio is the 6th largest wine and 9th largest grape-producing state with a retail value of $61 million in wine sold. The Buckeye State has 265 wineries that employ 8,067 full-time workers who produce nearly six million gallons of wine annually. Whether you are an established grower or wine maker, or are just interested in getting started in this important economical industry, this workshop will provide valuable information for you to take back to your operation. Topics covered will include a 2018 vintage overview, vineyard soil and tissue analysis, assessing vine balance, sulfur dioxide management in the cellar, new and existing varieties for quality wine production, and essential issues in fermentation management. Attendees over the age of 21 will also have the opportunity to sample some of the wines made from new and existing wine cultivars. Presenting these topics will be experts from the Ohio State University Department of Horticulture Crop Science. Scheduled for the workshop are Enology Program Manager Todd Steiner, Viticulture Outreach Specialist Dr. Maria Smith, Research Associate Dr. Lisa Dunlap, and Enology Lab Manager Patrick Pierquet.